Vintage sheet fat quarters from the Chaletgirl swap. Lots of possibilities here. I'm thinking maybe cute tiered baby peasant dresses to start. The first three (I think) totally finished Project Improv quilts (I did the binding). I really enjoyed being able to have the time to really get a close look at these quilts. They are so amazing. I can't wait to do more of them. what a great chance to check out all those pretty quilts. Beautiful. Binding is one of my favorite parts of quilting. and those vintage sheet squares are gorgeous. I can not wait to see what beautiful creation you make of those. Yay -- another vintage sheet collector! I've been bringing them home obsessively and then not using them. I finally made a few cute tops out of them and am getting ready for a quilt or two. I really like the one of yours with big, bold flowers on the left. 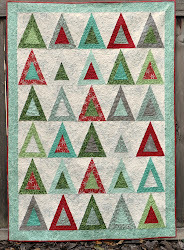 I love your improv quilts and am anxiously awaiting the progress of your project(s) using the vintage sheets. wow! you sure scored with those sheets! i love working with them...so soft. you don't know how much i appreciate you doing that binding. see you soon.